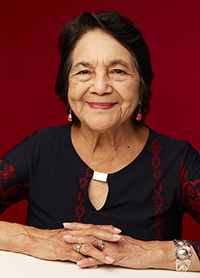 Dolores Huerta has worked for labor rights and social justice for over 50 years. In 1962, she and Cesar Chavez founded the United Farm Workers union. She served as Vice President and played a critical role in many of the union’s accomplishments for four decades. In 2002, she received the Puffin/Nation $100,000 prize for Creative Citizenship, which she used to establish the Dolores Huerta Foundation (DHF). DHF is connecting groundbreaking community-based organizing to state and national movements to register and educate voters, advocate for education reform, bring about infrastructure improvements in low-income communities, advocate for greater equality for the LGBT community, and create strong leadership development. Huerta is the focus of a 2017 documentary called Dolores. She has also received numerous awards: among them The Eleanor Roosevelt Humans Rights Award from President Clinton in 1998. In 2012 President Obama bestowed Dolores with The Presidential Medal of Freedom, the highest civilian honor in the United States. Parking for events is available after 4 p.m. in the Fred L. Barrera Parking Structure on Sycamore and in the Lastinger Parking Structure on Walnut Avenue. The cost is $2 for 2 hours and $3 for 4 hours. The machines require exact change or credit cards. Vehicles without permits or vehicles parked in restricted lots/spaces will be ticketed. Parking is not permitted along city streets without a City of Orange permit. For more parking information, visit the Chapman visitor parking page. You can contact the event organizer, at education@chapman.edu.